Working with Santana and Heather was TRULY a breeze, and it made planning my wedding as a professional student a piece of cake! They were so in tune with my vision and goals for the wedding that I didn't have to worry about a thing in the weeks approaching the wedding. Could not recommend them enough! If you want a planner who is always on top of their game, able to help you at a moment's notice, and will make planning a wedding as stress free as possible, you've gotta go with Events by Santana! Thank you for the kind words Mckenzie! We loved working with you & Grant! Best of luck & love forever! There are not enough positive things I can say about Events by Santana! They worked with my husband and I all along the way to make our dream wedding become a reality! Santana and Heather are so professional and very responsive! The day of the wedding I didn't even have to worry about anything other than relaxing and getting dolled up. They had everything very under control. I would highly recommend Events by Santana to anyone planning a special event! Thank you so much Arin for the review. 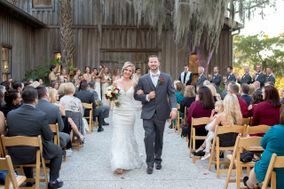 We loved working with you and Dustin on your dream, barn wedding! Best of luck & love forever! Thank you so much Hannah! You were so fun to work with and we truly enjoyed planning your unique wedding! Santana was awesome! Very easy to talk to. She responded to me in a timely manner. I had no stress the day of my wedding, all thanks to Santana! Santana and her team were amazing to work with! She made our entire planning process smooth and our day would not have been possible without her! Thank you so much Dana! We loved working with you and Joe and loved every minute of your sweet, intimate wedding! where do i begin in thanking you. reminiscing with so many people about our special day, one of the first things they say is, "your wedding planner was on point." and im in full agreement. so for that, from the bottom of taylor & i's hearts, thank you. as for the review, guys if you can't tell by reading the first part. she's more than amazing. she went out of her way to calm everyone & allowed us to enjoy every second. from the first night we sat down & met 6/8 months ago to the day of the wedding, she had a six sense about how our day was going to go. santana did anything from grabbing us drinks during pictures, to making sure we were aware of what was going to happen next. theres so many adjectives i could use to describe her. i hate to limit myself to one but "extraordinary" sticks out. if you want someone to work with, thats going to deliver the goods, she's it. there are no others. GUYS CALL THE NUMBER OR MESSAGE HER FOR YOUR EVENT! GO NOW!